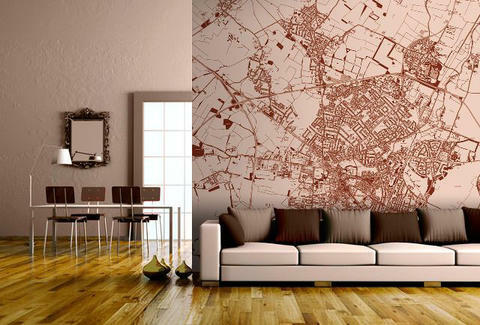 Taking a more literal approach to "street style", Wallpapered's Map Murals are easily installed, "wipable" wall-coverings that feature the aerial view of the burb of your choice, and are avail "in any colors you might require", so get ready to paint the town red, you wild homeowner, you! Simply plug in a zip code & your preferred scope (up to 10mi from the town center), give 'em your wall dimensions & any color specs (you want red, remember!? ), and once you've approved the mockup they email over, it'll only be about a week 'til the finished roll arrives ready for hanging.